To study the effect of immigration policies on patterns of circulation, we used two new databases DEMIG compiled over the past four years. The DEMIG C2C database tracks country-to-country migration flows between 38 destination countries and a worldwide selection of origin countries. The DEMIG VISA database details travel visa requirements for every country from 1973-2010. In the paper, we treat visa requirements as an important instrument used by governments to prevent the unlimited immigration of people from ‘undesired’ countries. 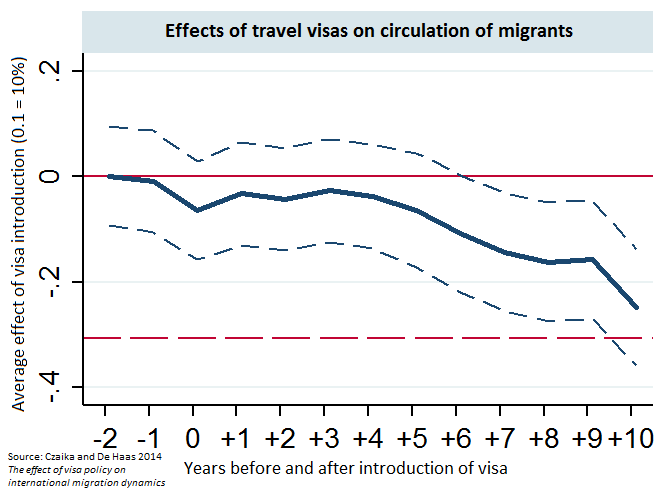 The irony seems that policies that officially aim to reduce immigration and stimulate the return of ‘less desired’ low-skilled migrants often have the opposite effect of interrupting circularity, increasing family migration, and encouraging permanent settlement.